Black applicants are more likely to be denied housing loans than their white counterparts, the effects of this exacerbate an already widening racial wealth gap that results in white families accumulating 10x the wealth as Black families. 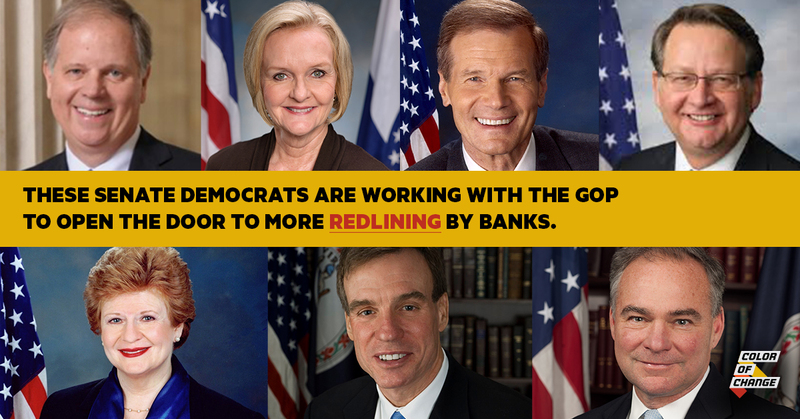 Now, 16 Democrats in the Senate are aiding banks in continuing discriminatory practices that lead to redlining Black communities and sow the seeds for another subprime mortgage crisis. Last week the U.S. Senate voted to move forward with a bill that would exempt 85% of banks from reporting critical data that would allow regulators and fair housing advocates to ensure that Black consumers aren’t being steered towards predatory home loans. The bill would also allow banks to engage in the same type of risky behaviors that triggered the last financial crisis. Senate Democrats like Doug Jones of Alabama, Bill Nelson of Florida, Gary Peters and Debbie Stabenow of Michigan, and Claire McCaskill of Missouri have all voted in favor of allowing this bill to continue in the Senate. All of these Senators represent Black communities that were among the hardest hit by the last housing crisis and all of them represent metro areas where Black people are significantly more likely to be denied a conventional home loan. It makes no sense to loosen the regulations on the largest banks in the country or to weaken important protections for Black homebuyers and homeowners. History makes clear that bankers and policymakers are not the ones who bear the immense burdens of a financial crisis. That cost falls on the shoulders of Black people, families and communities, many of whom still have not fully recovered from the previous crisis. You must prioritize the needs of your constituents over the interests of the financial industry, that has a documented history of discriminating against Black consumers. This bill gives leeway to financial institutions that are already making record profits and posits them to profit even more from the exploitation and plunder of Black wealth. Black communities overall, and your constituents especially, deserve better.